Professor of Sanskrit and comparative philology in Johns Hopkins University, Baltimore, Md. ; born at Bielitz, Austrian Silesia, February 23, 1855; emigrated to America in 1867. He studied at Chicago and Furman, (S. C.) universities, and at Yale, Berlin, and Leipsic, and received the degree of doctor of philosophy from Johns Hopkins in 1879, while Princeton conferred on him the honorary degree of doctor of laws in 1896. Bloomfield is one of the most prominent Sanskrit scholars in America, and is recognized as the chief living authority on the Atharva Vêda. Besides Sanskrit, Bloomfield has made contributions to comparative grammar, Greek, Latin, and Balto-Slavic, and has treated various problems of the science of religion, especially in relation to India and its literature. He is a member of the American and German Oriental societies, American Philological Association, Royal Bohemian Society of Prague, and other learned bodies. Among Bloomfield's chief works are: an edition of the "Kauçika-Sutra," New Haven, 1890; a volume of selected hymns from the Atharva Vêda, with extracts from the ritual and commentary, forming vol. xlii. of Max Müller's "Sacred Books of the East," Oxford, 1897; and "Atharva Vêda," Strasburg, 1899, forming a portion of the "Grundriss der Indo-Arischen Philologie" of Bühler and Kielhorn. His latest contribution, in which he has been assisted by Richard Garbe of Tübingen, is a magnificent photographic edition of the Paippalada recension of the Atharva Vêda, 3 vols., Baltimore, 1901. Lamb, Biographical Dictionary of the United States, i. 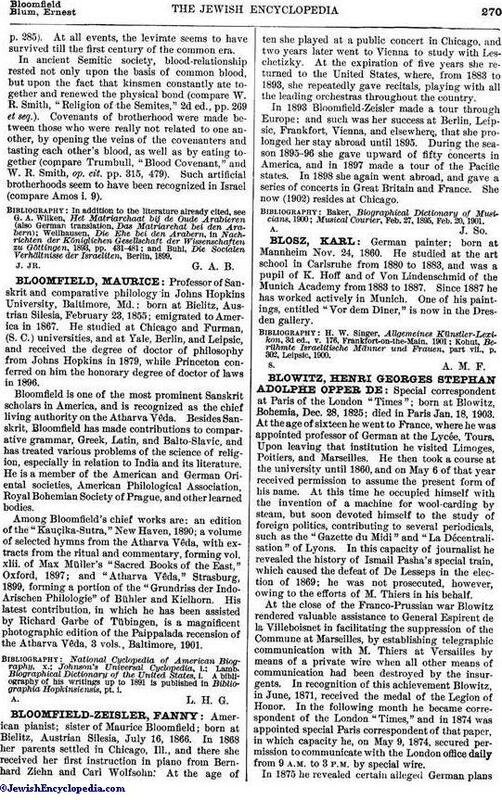 A bibliography of his writings up to 1891 is published in Bibliographia Hopkinsiensis, pt. i.